And one such concept is of mind mapping and concept mapping. Concept mapping and mind mapping are both types of visual mapping. And when it comes to these concepts, the main difference does not just exist in terms of the definition of these concepts but there are also many differences which exist in terms of the key characteristics of concept mapping and mind mapping. But this does not mean that there are no similarities between these concepts. Instead, there are a number of points which are similar between these concepts. In this blog, the focus will be on learning about the definition, the structures, key characteristics, and the similarities of both these concepts. All these points of discussions are mentioned below. For the ease of the readers, all these specific points are also discussed under separate headings. In this section, the readers will be able to learn more about concept mapping. The major points of discussion are the definition, the visual structure, and the key characteristics. All of these information pieces are mentioned below. A concept map is also known as a conceptual diagram. It can be defined as a diagram which depicts all possible relationships which might exist between any two or more concepts. This is also often considered as a rather important graphical tool which is widely used by engineers, instructional designers, technical writers, and many other professionals to structure and organize all sorts of knowledge. This is also used as a teaching and learning technique by students and other working professionals. In a concept map, boxes and circles are used to link phrases or words which are used to depict the relationship which exists between any two or more concepts. This can also help a student to structure and organize all the information and thoughts which are related to those concepts. It is also important for the readers to note, that most concept maps are presented in hierarchical order or structure. All concept maps also begin with the main idea or concept which then further branches out to show the relationships. There are also many benefits to using a concept map. And some of those benefits are mentioned below. These are all the major benefits which an individual can get if he or she used concept maps. As it was mentioned above, all ideas and information pieces are represented in circles and boxes. All of those circles and boxes are connected with the help of arrows and are arranged in a hierarchical structure which is branching downwards. There are also many linking phrases which are used like requires, causes, and contributes to. There are also different key characteristics of a concept map. And some of those important characteristics of a concept map are mentioned below. These are all the key characteristics of a concept map. In this section, the focus will be on learning more about mind maps or mind mapping. All the discussion points are mentioned below. A mind map can be defined as a diagram which is used by professionals to visually organize all sorts of information pieces. Mind maps are often created for a single concept. Most of the mind maps depict relationships in a hierarchical manner of the entire concept. In mind maps, the entire focus relies on the main idea. All associated thoughts, ideas, parts, and words are also added to the mind map. 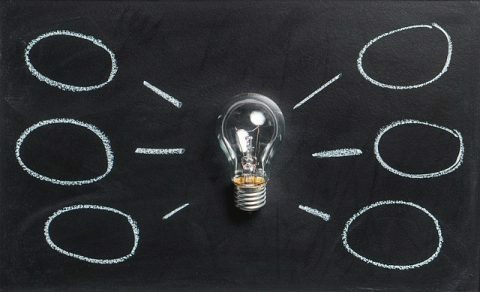 It is also important for the readers to note that, all major ideas are directly connected to the critical or main idea and the other ideas are further connected to those critical points. Students and working professionals often face a number of issues when creating a mind map. Hence, it is also important for an individual to learn about the procedure of creating a mind map. All mind maps begin with a basic idea or concept. So, first it is important for an individual to choose that basic concept or idea. Once that idea is finalized, then it is important to choose a word or small phrase to represent that concept. After that, one must create branches which expand on the main idea or the concept which is under consideration. It can also be quite helpful to use all sorts of colors, images, and different fonts to highlight the main ideas and thoughts which are present in a mind map. The mind map often declares the major or the main idea directly. There are also ‘basic ordering ideas’, which are also known as first-order topics, which define the basic scope of the details which would be discussed. There are also ‘child topics’. These child topics are the topics which diverge from the critical ideas. There can be many layers of topics which can be included in a mind map. There can be many purposes of a mind map but all mind maps are also often embellished by using different types of colors, box sizes, fonts, images, and icons. There are also many key characteristics of a mind map. And some of those key characteristics are mentioned below. These are the major key characteristics which are related to mind maps. Concept mapping is the procedure in which a concept map is created and a concept map can be defined as a diagram which represents the relationships which exists between two or more important concepts and ideas. On the other hand, a mind map can be defined as a diagram which is used to visually organize information in a coherent and hierarchical manner. It is also advised for an individual to use different types of fonts, colors, images, and shapes to make a mind map more visually stimulating. There are also many other ways in which a mind map is different from a concept map like the difference between the visual structure, and many other points.